Sandeep Chaudhury on Microsoft Dynamics 365 Blog Dynamics 365 For Talent Management, What does it offer ? How can you benefit from it ! Microsoft Dynamics 365 For Talent is a best of breed talent management cloud solution from Microsoft which has been available for a few months now and several customers are already underway adopting this new solution. In one of my posts earlier, I provided a sneak peak into this solution and described the key components/modules. In this post today, let us understand this solution in little bit more depth, discuss some buying options and also we will dive deep into the “Attract” experience of Talent specifically. Dynamics 365 For Talent has 3 core modules. They are follows. Core HR Operations (To drive HR operational efficiency and manage day to day HR activities. What are the buying options for Dynamics 365 For Talent? Well, Microsoft has made this part really flexible and allows customers to chose what, how and when they need it. Below are some additional details. The Dynamics 365 Best Value Plan: If you have chosen or implementing Dynamics 365 for Finance and Operations – Enterprise edition and you subscribed for the Dynamics 365 Plan(Best value Plan), then you get access to Dynamics 365 for Talent by default, along with other best in class enterprise apps such as sales, marketing, finance & operations, retail and more. Unified Operations Plan: If you have subscribed to this plan, you have access to Dynamics 365 for Finance & operations(Enterprise edition), Retail and Dynamics 365 for Talent by default. The above 2 plans are best for customers who are looking for more comprehensive implementation of ERP, CRM and Talent management apps and have chosen Dynamics 365 to be their all in one business application platform. Dynamics 365 for Talent Best value Plan: Dynamics 365 For Talent offer’s it’s own Best value plan. This plan includes all the 3 components of Talent management which are “Attract”, “Onboard” and “Core HR”. This allows you to start implementing Dynamics 365 for Talent management for all your Talent and HR requirements and then optionally integrate it with your other business apps that you may be using for project, finance and operations management. Modular Apps Plan: Dynamics 365 for Talent platform is even more flexible and allows you to subscribe only to the specific “Attract” and Onboard” experiences of Talent, so that you can use those for all your talent recruitment needs, and then optionally integrate it with other core HR and Payroll management or finance and operations app that you may have implemented. These are really great ways to start with what you need first and then grow and adopt more apps for specific operations as the need arises. Click Here for details on pricing, licensing etc. In this post today, let us dive deep into some of the functionalities of the “Talent Attract app/experience” of Dynamics 365 for Talent. Talent Management always begins with having the required Job openings of your organization defined clearly. Below screenshot shows how the landing page of the “Attract” experience of Talent looks. This shows All the Jobs (Active and Closed) of your organization. You can create new jobs and specify if you are a Hiring Manager or Recruiter and you can import jobs from an Excel file just by dragging and dropping the file. Now, lets see what goes underneath a job and what settings does it contain. When you create a job, you can define additional job settings such as a detailed job description, Job location details and also a reference to an external job posting on most popular job posting portals such as “Linked In“, “Indeed” and “Monster“. See screenshots below. You can very easily create your Hiring team, which can include an Hiring manager, one more interviewer, a recruiter etc. You can chose people from your organization (If you have Office 365 it is even easier). With job defined and setup now, let us how you would manage applicants on this job. 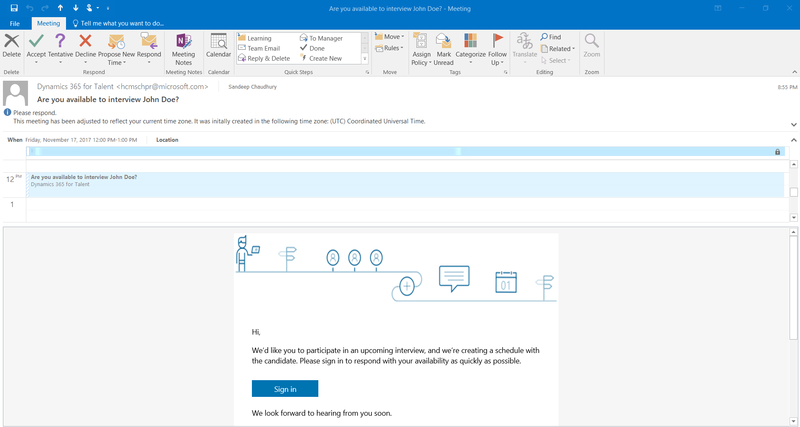 Since each job listing can be linked to an external job posting on LinkedIn/Indeed/Monster, you would imagine that job applications from those portals can be directly converted to applicants of the job in Attract experience of Dynamics 365 for Talent (Not able to test this since I don’t have a subscription for those portals). However, you can add applicants manually or add several applicants at once, by simply dragging and dropping an excel file containing the applicant details. When adding applicants, you can link their linked in profile directly into the applicant profile and it will pull information from LinkedIn right into Talent app. When Microsoft acquired LinkedIn a few months ago, we all wondered why this ? Well, this is one of the many benefits and outcomes we are going to see in near future. Let us say John Doe is applying for the Creative Director job at your organization. I have linked my LinkedIn profile to John’s applicant profile, to be able to test it. Now that we added John Doe as an applicant, Dynamics 365 automatically sends John an email notification notifying him that his job application has been received by SBS Group, so that John stays in loop in the proceedings of the job application. Additionally, John can simply sign up to Dynamics 365 for Talent using his LinkedIn credentials and stay up to date with the proceedings. The candidate can simply sign up into Dynamics 365 as a candidate using their LinkedIn credential. With that said, let us move on to Screening John and take the process through that experience. At the Application level, I can upload Resume/Cover Letter etc. by simply dragging and dropping files and I can see candidates resume right within Talent with the power of Office 365 integration. John Doe, the applicant for Creative Director job now moves to the Screening stage. You will notice that Dynamics 365 is able to pull John’s LinkedIn profile data right into Talent. The Recruiter/Hiring manager can enter any Notes and then Request the candidate for availability by selecting some date proposals. With the power of Dynamics 365, the Candidate is kept in loop with automatic email notifications and gets to see this availability request on his/her smartphone and he is also able to review the details and respond to the request with his/her preferred date. As you can see, John confirmed that November 17th works best for him, the Hiring Manager or the Recruiter can now login to Dynamics 365 and see that date and use that to confirm the interview. The recruiter can now easily select the interviewers from the Hiring Team or even add other participants and then Invite the team to schedule the interview. The recruiter can select additional date proposals for the interviewers and also indicate the Candidate’s preferred/confirmed date. They can also chose to include an online meeting, which in turn would include details of a Skype for business meeting details or Microsoft Team meeting info automatically into the meeting request. This leverages the power of integration with Office 365. With the power of Office 365 integration out of the box with Dynamics 365, the Recruiter will also be able to too look into calendar availabilities of the Interview team right within Dynamics 365. The interviewers will get notified automatically via email and the candidate will also be updated. The hiring team members and individuals can then login to Dynamics 365 to submit their feedback in real time and mention strengths and weaknesses of the candidate. At the end of this process, when the candidate is finalized and ready to be hired, you can go to the Prepare offer experience to create and send offer to the candidate. Note that the “Offer” functionality/experience of Talent is still in Preview and I am not able to reveal much about it at this point. But as you can imagine, you will use this experience to do everything that goes into preparing and communicating with a candidate regarding offer. Let us stop at this for this post. In the next post, we will use the Onboard experience of Dynamics 365 for Talent to onboard John and evaluate how that experience looks like.